Counterfeit Chic: The Counterfeit Triangle? Attention New York tourists: Canal Street is closed. Or a least part of it is. For the moment. 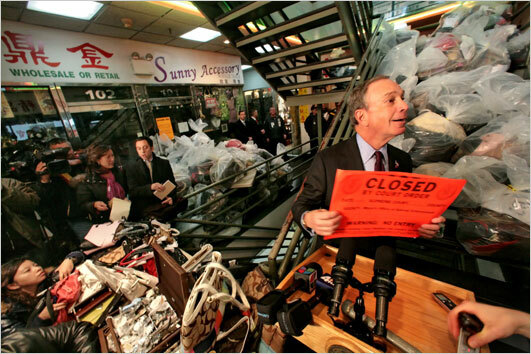 After the police conducted a $1m raid Tuesday morning, Mayor Mike Bloomberg posed with a "CLOSED" sign among the trays of fake watches and piles of counterfeit handbags. The bust involved 32 separate storefronts, all owned by the same estate and located in a triangular city block newly dubbed the "Counterfeit Triangle," bounded by Canal, Walker, and Centre Streets. The counterfeit trade, according to the press release, is "standing in the way of the revitalization of Chinatown," and the mayor intends to make renting to counterfeit retailers "a losing business proposition." If the Counterfeit Triangle is anything like the surrounding blocks, however, its mystery is not one of unexplained disappearance but incorrigible reappearance. Seize the merchandise, arrest the sellers, put up warning signs, raze the buildings, sow the earth with salt -- and still a runner will stand on the corner whispering a litany of familiar brand names. But hey, the mayor isn't running for President, so he's got to set up a podium somewhere. Call it the politics of hope. Via the New York Times City Room blog.